The internet was more important at this year's general election but did not make any great breakthrough, says a report from a democracy group. 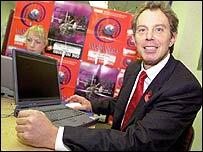 The Hansard Society study points to research suggesting online activity has doubled since the 2001 polls and has made voters feel better informed. But still only 15% of the population went online to get information about the election, it says. The report says the internet was used too much as a "one-way" conversation. The election followed the increased use of online campaigning in last year's US presidential elections. 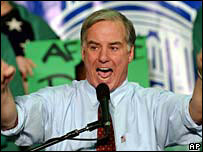 The success of Democrat Howard Dean in using the internet to attract donations fuelled speculation of a surge in online campaigns in the UK. But Steve Ward, from the Oxford Internet Institute, says people should not expect the US experience to be repeated in the UK. He argues the British political system offers fewer incentives for using the internet, whereas US presidential candidates have to build campaigns from scratch for the primaries. "In the UK, well-entrenched party machines and the relatively localised nature of election campaigning mean that currently traditional communication tools work just as well if not better," he says. 18% of those questioned this year said the internet had helped them make a better informed choice and 19% said that it helped them make up their mind - compared to 6% in 2001. Dr Ward adds: "Internet users may be as likely to vote today as they were four years ago, but the overall importance of the internet for the election has greatly increased." At the launch , Stephen Coleman, professor in e-democracy at Oxford University, said there had been no surge in internet election use. Instead, there had been an incremental and pragmatic use in the campaign of a medium used in other ways for the rest of the year. Prof Coleman said there were three main uses of the internet during the election: activities unconnected with the poll; people going online to avoid the election and find other news; and those using the internet to find out more about the vote. But he said only 3% of people expected to have contact with their MP once the election was over. "There can be little doubt about the potential of the internet as a medium of democratic interactivity," says Prof Coleman. He says: "But unless and until parties, politicians and pundits abandon the one-way conversation that has come to characterise contemporary politics, no amount of broadband gee-whizzery will save them from the collective yawns of the demos." Prof Coleman said the 2001 election had seen the emergence of blogs and other discussion outside traditional scripted politics. If the political machines tried to grasp those tools too much there was a risk the public might "migrate elsewhere", he warned. New Liberal Democrat MP Lynne Featherstone, a long-time blogger, said online campaigning was just one of the tools she used. But she suggested it had played a substantial part in overturning a 26,000 Labour majority in Hornsey and Wood Green over the course of two elections. The BBC News website's election output received 28 million page views on the day after the election, with more than 3 million people looking at at least one election page.